The Master Class will be highly interactive and participative. Miss DiPerna will give a short introduction on her experiences with large systems, current views and future priorities. This will be followed by sharing of soul-searching questions by the participants. Miss DiPerna will enter into a frank and stimulating dialogue with the participants. She will be direct and constructive, as well as inspirational and demanding. Everyone present is expected to be active participant; sitting back as an observer is not an option – just as real life. For most of the participants, the end of the Class will mark a new beginning of their careers and life aspirations. With deep expertise in the fields of climate change and green finance, Miss DiPerna is currently a Visiting Fellow of Civic Exchange and Special Advisor to the CDP (formerly known as the Carbon Disclosure Project) which runs a global disclosure system for investors, companies, cities, states and regions to manage their environmental impacts. She has acted as a consultant to the World Bank, the Global Environment Facility, and LEAD-International. 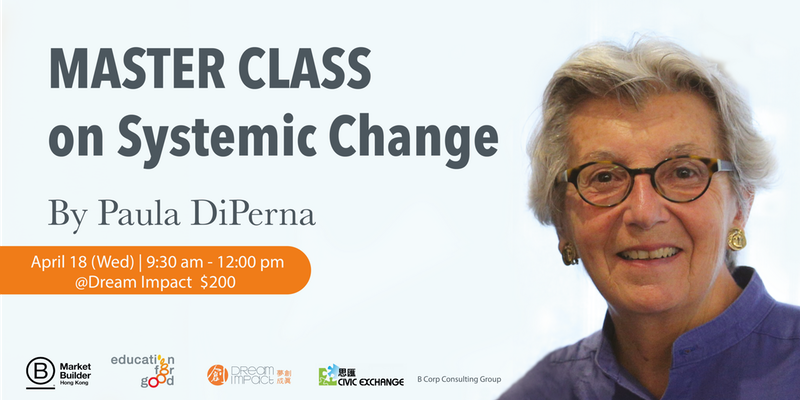 Click here for more background of Miss DiPerna’s rich experience and register the class!